The trip to India is said to be complete after the visit and watching the numerous Sights, Palaces in Jodhpur. There are several options available in the marketplace these days. Delhi Car Rental Service provides economical and reasonable prices, ensuring that you have a comfortable and convenient ride with us to explore the unexplored places in Jodhpur. 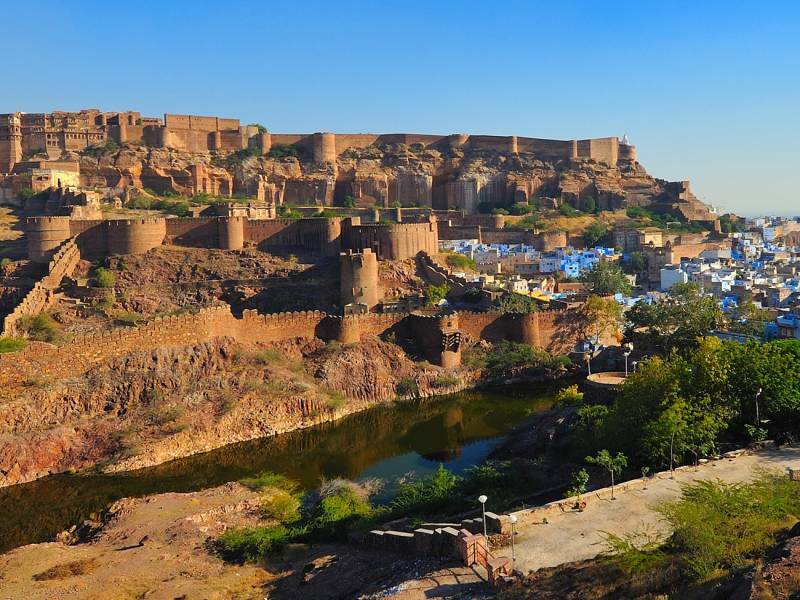 The Stunning Monuments at Jodhpur can be explored and visited in 3-4 days tour; it includes the visits to explore historic forts and temples, spectacular gardens, and the heritage hotels which have been converted from the very heritage palaces. Mehrangarh Fort is famous for exploring the palaces along with the museum and other attractions inside it. It is an important historical revolutionary and the famous Jodhpur magnetism. It is located at a height of 150 on a hill; and was built by Rao Jodha, the chief of the Rathore clan, in 1459. There are various elegant and beautiful palaces, galleries, historical temples, and museum located inside the complex. Jaswant Thada was built in the 19th-century Royal monument. The tomb was dedicated to Maharaja Jaswant in 1899. Other than the tomb, the place also boasts of spectacular gardens. The Jaswant Thada is also popular as an architectural marvel with elaborated statues. It is famous as the most attractive white marble monuments. Often it is considered as the synonym for Taj Mahal of Rajasthan. Umaid Bhawan is also very important and popular Palace in Jodhpur. The beautiful palace was built in the 20th century so as to give employment to 3,000 starvation stricken residents of Jodhpur. It has now been converted into the 5-star heritage palace hotel. Umaid Bhawan Palace is also called Chittar Palace; the heritage monument is divided into three zones, a heritage hotel, museum and the royal residence of Maharaja. Umaid Bhawan Palace is the best of the elite hotels of Jodhpur. Equipped with all sophisticated and ultra-modern facilities providing the royal experience. Mahamandir or Mahamandir Temple is located on Mandore Road. It is the great temple, stances magnificent and giant. Built on the foundation of 84 huge pillars ornamented with flawless skillfulness, engraving the numerous yogic stances. Government Museum shows and unique displays the rich and huge collection of weapons, textiles, small portrayals, local artistries and images of Jain Tirthankara or the sages. There are many other interesting artifacts. The visit to the popular museum is the sought after by all history lovers and admirers. Jodhpur Polo and Equestrian Institute is also a very commonly known attraction. The games take place in December and can be witnessed by the tourists. The polo sports lovers enjoy the Royals playing the sport and provide a novel experience. In case you are interested in playing as well, you may do so at reasonable charges. Sardar Samand Lake is famous for the Bird-watchers rejoice, the beautiful lake provides an excellent and spectacular viewing opportunity and watching the migratory birds. Around 60 kilometers on the southeast side of Jodhpur. On the path to the lake, the tourists enjoy spotting the animals like black bucks, Neelgai and Chinkara. Ghanta Ghar or the clock tower is a prominent and famous landmark situated in the old city. The lively Sardar Market is adjacent to the tower, and the narrow alleys go to the bazaar selling items like vegetables, spices, Indian sweets, textiles, silver, and It is a nice and great place to roam and ramble around during the leisure time. Japji Travel Solution Provider Company offers the Sightseeing by air-conditioned cars and other transportation options and makes you sit back and enjoy your ride, ensure the Doorstep Pickup services, Seasoned and professionally trained English speaking chauffeurs having the full knowledge about routes backed up with GPS Navigation, Hassle-free payments options. With these tours and travel options, provide us with an opportunity to transform the way you travel and concentrate on your touring extravaganza. You can bank upon us and head out during early morning hours on a full-day sightseeing spree and tour of Jodhpur city. This entry was posted in Rajasthan Tourism, Tourist Attractions and tagged Jodhpur Sightseeing Places Tour, jodhpur tours, places to see in rajasthan, sightseeings in jodhpur. Bookmark the permalink.